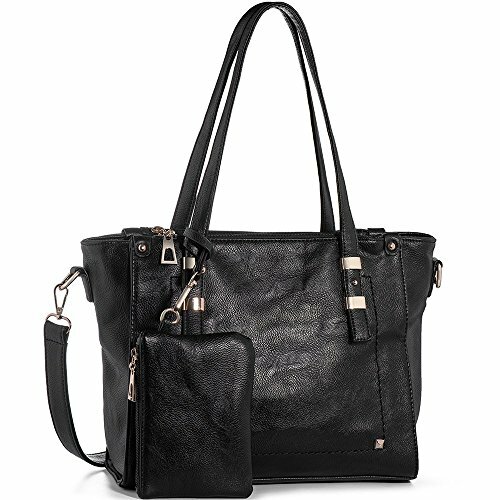 Usage:Top-handle # Shoulder # Tote # Crossbody. Height of Handle Strap:8.66 Inch. Capacity:A4 file # Mobile Phone # Wallet # Cosmetic # IPAD # Umbrella. Occasion:Dating # Meeting # Shopping # Traveling. Style:Casual # Business # Fashion. 1. Material&Lining: PU Leather,inner lining was made by fabric.Gold hardware & Dark brown interior lining.Zippered opening closure. 2. Convenient & Comfortable to wear in 4 ways: Handbags/Top handle bags/Shoulder bag/Cross body bag. 3. Structure: 1 main zipper[1 large zip pocket in the middle splits the bag into two parts] 1 small zipper pocket & 2 small open pockets & 1 zip pocket outside the back. 4. Capacity: Carrying your mobile phone, wallet, cosmetic, IPAD, umbrella and other daily things,decorating a exquisite/small purse. 5. Dimension: [11.81L*4.72W*10.23H]Inch.Handle Strap:8.66 Inch.Please see more details in Product Description. If you have any questions about this product by WISHESGEM, contact us by completing and submitting the form below. If you are looking for a specif part number, please include it with your message.